Controlling humidity in environments is vital to ensuring efficient project work or business continuity. At Air Solutions we understand that requirements may change depending on seasonal variations in humidity or on project work. That's why we provide short term rental options to help our customers always achieve the best environmental conditions possible. Great for small areas, the M120 is a portable dehumidifier perfect for small jobs. This dehumidifier is typically used for small rooms which need to be kept dry, small tanks or under house applications. The ML180 is a versatile dehumidifier used for all applications which need up to 180m3/hr in capacity. The ML180 was recently used in Avondale to keep milk powder drums dry during production. The MLT350, is the ML180's big sister with an addition booster fan built in to increase its capacity. Its small, compact size means that it is easy to install in all places. This is the largest single phase unit available. 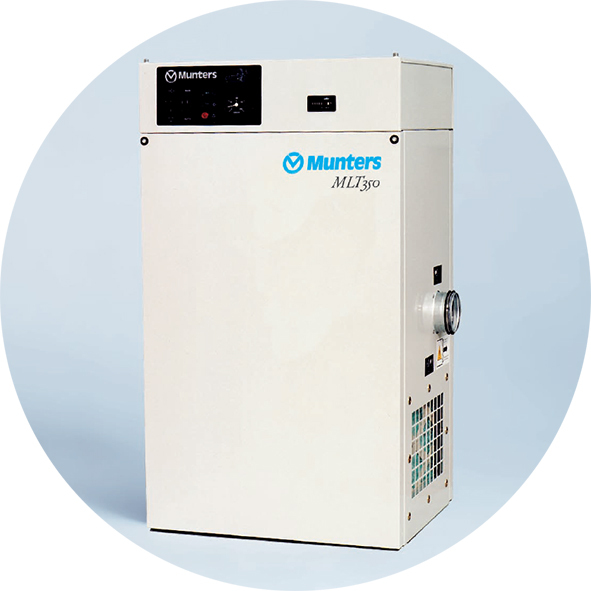 The ML1350 is our largest ML Range dehumidifier. This unit was recently used to remove high condensation on the walls and ceilings of a food processing plant.